This is the second time this school-year that we have had the opportunity to review products from AIMS Education Foundation. AIMS, as in Activities Integrating Math and Science. Last fall, we reviewed one of their science books, Earth Book, which was good. This time around, we were able to work with a math book, Fabulous Fractions. This book is intended for students in 3rd -5th grades, so I chose to have Thomas (5th grade) work through it with me. This has been fun. 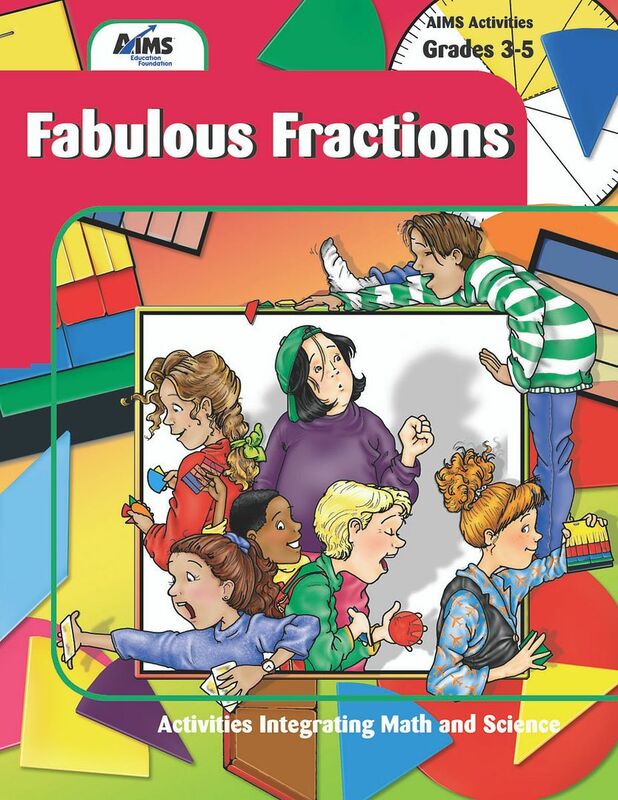 The book contains 22 hands-on activities relating to fractions, covering everything from the basics of what a fraction is up through multiplying and dividing them. These books are designed for classroom use, so there are a couple drawbacks for most homeschools. A lot of educationalese. Each activity includes a whole lot of talk about how this meets this, that or the other standards. Not a big deal, you just ignore that chatter if you don't need it. Some of the activities need to be adapted to do with just one student instead of a classroom. However, that was fairly easy to do, especially when I'd grab a brother to partner with Thomas in an activity. Some of the activities require an awful lot of preparation for just one student. Fortunately, those tended to be the more introductory ones, which Thomas was able to do without actually needing the manipulatives. One of the best features of all (or most?) of the AIMS books is that they come with a CD-ROM containing all the reproducible "stuff" so it is super-simple to print off what I need for my student. I'm very impressed. And the price is good too -- $21.95 for a print book, $19.95 for a pdf. I will most definitely be looking at others in their math series, and quite possibly some science titles as well. If you go check out their activity books, you'll see that they have math and science titles available for grades K-9. One on my wish list is Historical Connections in Mathematics, which is actually listed as being for Grades 7-12. Each of the three volumes in this series contains resources relating to ten different mathematicians. Disclaimer: As part of the TOS Homeschool Review Crew, I did receive the products mentioned above for the purposes of a review. All opinions are my own. For more about my take on reviews, visit my blog post here.